The point of getting custom decks is to have the structure made to your own personal aesthetics and the requirements of your landscape. Your garden is special and so is your family’s expectations and your personal taste. Before you turn to a local deck contractor, you need to know basics like the location, the size, or the material. You also need to consider your lifestyle, the weather conditions in your area, how much time you spend outdoors, and your budget limits. But let us go ahead and see the main points which will help you customize your outdoor decking. Deck building must be customized to suit the garden’s size. A large yard gives room for large decks; otherwise, a big deck will overwhelm the outdoor space and won’t provide the expected finesse. 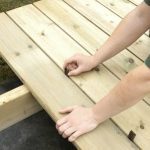 The terrain might be uneven and although this won’t be a problem for the deck builder, you need to take it into consideration when you think about the height of the deck. You can have the deck made as tall as you want but it must not obstruct other structures while you must consider the age of your family members. For example, if you have children, you need to incorporate durable and tall deck railing systems and wide staircases. When it comes to staircases, you need to decide about their location too. If there is another living space in the yard, it would be best if the stairs led straight to it. Let’s talk materials first. You have many options among vinyl, composite, and wood decks. Each differs in terms of cost and maintenance while the aesthetic result is not the same either. Wood is the traditional choice and has a warm and sophisticated appearance whereas composite decking is often chosen for its maintenance free properties although it costs more. So here, your decision has to do with your taste but it is also affected by your budget and maintenance expectations. 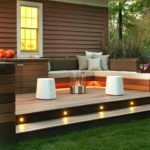 When it comes to the deck construction design, you have plenty of options too. This is up to you. The patterns range from herringbone and diagonal to straight boards, accent boards etc. You can actually have the deck builders cut and install the boards in any direction and design you like. The importance here is to maintain a symmetry with a repeated pattern to make the deck interesting and impressive. When you are done calculating the deck costs, have decided on the design, and all the details that will address all technical matters, it’s time to take into account your lifestyle. Your cedar custom decks should be attached to the house if you are planning to install them right in front of the kitchen and like to eat outdoors. Another thing to consider is whether or not you like an outdoor kitchen in which case you need to be sure there is enough space on the deck for it. Then you must start thinking of how you plan to use this outdoor area in order to make the deck more comfortable. For example, you need to consider the garden furniture you have or want to get and see if the deck is designed to be big enough to fit them. You can always use furniture with hidden storage space for your comfort. Matching a wooden pergola as the overhead structure will not only complement the deck but provide a better sheltered outdoor space. Anything from the shape, height, and size of the deck to the materials and design is subject to your taste, family requirements, lifestyle, budget, and landscape. It’s important to plan carefully and always with these things in mind because whether you go for a large pressure treated decking or a striking ipe deck, it must make you happy and last for years.